The two credited writers for “Leviathan” were David Webb Peoples (“Blade Runner,” “12 Monkeys,” “Unforgiven”) and Jeb Stuart (“Die Hard,” “The Fugitive”). The director, George P. Cosmatos, is best known for films like “Cobra,” “Tombstone,” and “Rambo: First Blood Part II,” for which he received a Golden Raspberry nomination. The “Leviathan” visual effects team was comprised of Rene Clark (“Detroit Rock City,” “Bunraku”), C. Mitchell Bryan (“Robot Jox,” “Stargate”), James Belohovek (“Troll,” “Evil Dead II,” “The Thing”), Ed Thompson (“Mystery Men,” “SpaceCamp”), Paul Stewart (“Tango & Cash,” “Speed 2: Cruise Control”), David B. Sharp (“Fortress,” “Muppets From Space,” “Event Horizon”), Barry Nolan (“Maximum Overdrive,” “Dune”), Niels Nielson (“Lawnmower Man 2,” “The Fifth Element”), Richard Malzahn (“Kull The Conqueror,” “Suburban Commando,” “Joe Dirt,” “Serenity”), and Jurgen Heimann (“Pacific Rim,” “Attack The Block,” “Hellboy”). 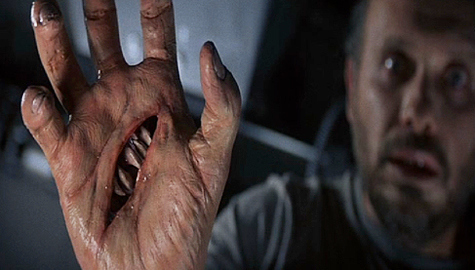 The makeup effects on “Leviathan” were done by a group that included Katalin Elek (“Double Team,” “SpaceCamp,” “The Monster Squad”), Bruce Barlow (“From Beyond,” “Virtuosity,” “Arena”), Zoltan Elek (“Street Fighter,” “Timecop,” “The Day After”), and John Rosengrant (“Small Soldiers,” “Congo,” “Batman Returns,” “The Avengers”). 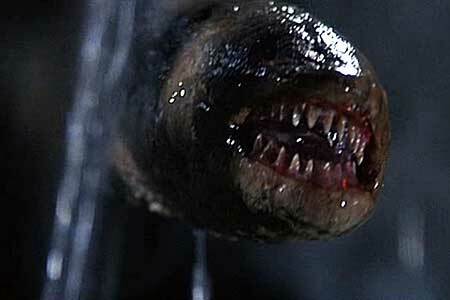 The massive special effects and creature design team for “Leviathan” was provided by the legendary Stan Winston Studios, and included, aside from Stan Winston himself (“Bat People,” “Lake Placid”): Tom Woodruff Jr. (“Tremors,” “Paul Blart: Mall Cop 2”), Jeff Kennemore (“The Garbage Pail Kids Movie,” “Class of 1999”), Richard J. Landon (“Predator 2,” “Constantine”), Shane Mahan (“Iron Man,” “Inspector Gadget”), Karen Mason (“DeepStar Six,” “Where The Wild Things Are”), Pat McClung (“The Abyss,” “Masters of the Universe”), Jim McPherson (“Slumber Party Massacre II,” “State of Play,” “Deep Blue Sea”), Hal Miles (“976-EVIL,” “Leprechaun 4: In Space”), Brian Penikas (“Tank Girl,” “Face/Off,” “Guardians of the Galaxy,” “Interstellar”), John Rosengrant (“Aliens,” “Predator,” “Small Soldiers”), Andy Schoneberg (“Mortal Kombat,” “Planet Terror”), Grant Arndt (“Hell Comes To Frogtown”), John Blake (“From Beyond,” “Starship Troopers,” “Showgirls”), Roger Borelli (“Dollman”), Mario Cassar (“Cutthroat Island,” “Final Justice”), Craig Caton (“The Stuff,” “Big Trouble In Little China”), Steve Frakes (“Evolution,” “Jumanji”), Mark Garbarino (“Kung Fu Killer,” “Paul Blart: Mall Cop 2,” “Robot Holocaust”), Alec Gillis (“Dragonball Evolution,” “Grown Ups 2”), Steven James (“Mac and Me,” “Baby’s Day Out”), Steve Johnson (“League of Extraordinary Gentlemen,” “Humanoids from the Deep”), Michael Spatola (“C.H.U.D. II: Bud the Chud,” “Going Overboard,” “Zomboobies!”), Shannon Shea (“Ghosts of Mars,” “In The Mouth of Madness,” “House”), and many, many others. 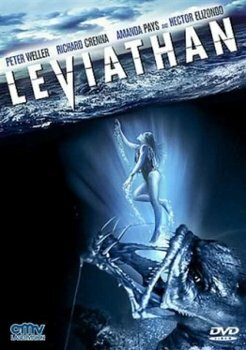 The music for “Leviathan” was provided by Jerry Goldsmith, a proficient film composer and conductor with over 250 composition credits, including “Small Soldiers,” “Congo,” “Supergirl,” “Capricorn One,” “Total Recall,” “The ‘Burbs,” “Chinatown,” and “The Omen,” among countless others. 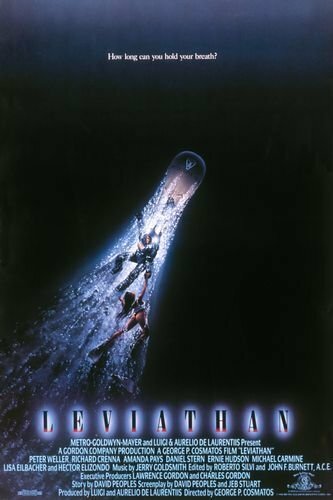 The cast for “Leviathan” included Peter Weller (“RoboCop”), Ernie Hudson (“Congo,” “Ghostbusters”), Daniel Stern (“Home Alone,” “City Slickers”), Richard Crenna (“First Blood,” “Judging Amy”), Amanda Pays (“The Flash,” “Max Headroom”), Lisa Eilbacher (“The Last Samurai,” “Beverly Hills Cop”), Hector Elizondo (“Chicago Hope”), and Meg Foster (“They Live,” “Masters of the Universe”). The story of “Leviathan” follows a crew of deep sea minors who stumble across a mysterious Soviet shipwreck that contains strange, genetic monstrosities that begin to hunt down the crew members. Interestingly, very little of “Leviathan” was actually filmed underwater, but the illusion is built up impressively with the lighting, particles in the air, and misting. I was surprised how believable the ultimate product actually was, though it is certainly noticeable when you are keeping an eye out for it. The reception for “Leviathan” wasn’t exactly positive, though people seem to have softened to it in retrospect: it current has a 5.7 IMDb rating, alongside Rotten Tomatoes scores of 14% (critics) and 25% (audience). The domestic gross for “Leviathan” was just under $16 million on a budget of $20 million, meaning it failed to make back its money in the theatrical run. Of course, the fact that the 1989 movie market was saturated by deep sea adventures (six in total: “DeepStar Six,” “The Abyss,” “Endless Descent,” “Lords Of The Deep,” “The Evil Below,” and “Leviathan”) certainly didn’t help its odds of being profitable. The focus on the characters does weigh things down a little in the middle, but I also thought that it made the characters a little more real and relate-able. They aren’t expertly written by any means, but the crew is more interesting than your typical sci-fi flick today. The effects work isn’t bad in “Leviathan,” but it is nowhere near groundbreaking. 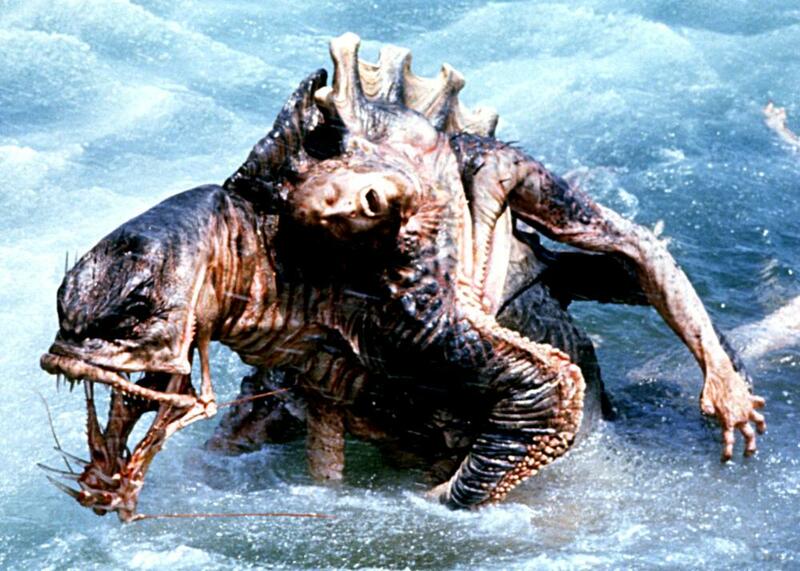 I did definitely like the early stage design of the creature as a lamprey, which I thought was the coolest aspect of the effects work. However, the ultimate product in the final stage of the creature’s evolution just seems too busy, and looks a little ridiculous because of it. “Leviathan” is a pale comparison to similar sci-fi horror of the era, but it has to be looked at on its own merits if you ask me. 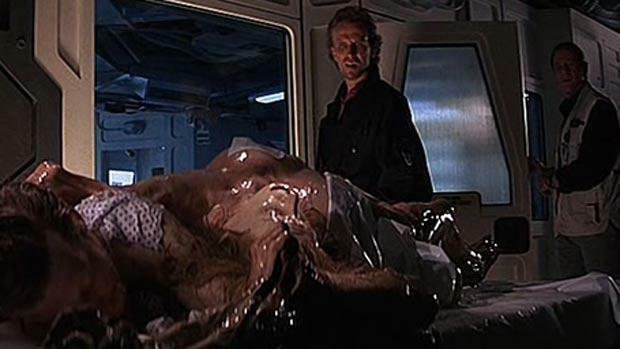 It isn’t as flagrant of a rip off as “Humanoids from the Deep,” but it isn’t exactly subtle about borrowing elements from “Alien,” “The Thing,” and “Aliens.” Interestingly, it predated “The Abyss” by just a few months, despite many seeing it as a knock-off of that film in retrospect. As far as the cast goes, Daniel Stern and Ernie Hudson are pretty great, and ham up their roles well. Peter Weller takes on the lead duties just fine, but as with most of his characters, he isn’t exactly flashy. He has a couple of fantastic lines towards the end of the film, though. If you ask me, I think “Leviathan” suffers from having too many false endings. The shark bit, for example, was just totally unnecessary, and was immediately follow up with another surprise. 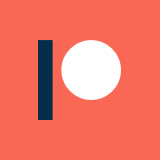 You can’t just toy with the pacing and arc that much, particularly at the very end of a story. 1989 was, of course, well into the tail end of the Cold War. It was an interesting touch having the ship and creature be of Soviet origin, given there were a lot of worries about nukes and other weapons going unmaintained or forgotten as the Soviet Union was falling. Overall, there are some fun bits throughout “Leviathan,” but it isn’t particularly memorable as a whole. It definitely suffered in the public eye by being one in a massive field of deep water movies in 1989. It also drags a bit too much, and borrows a little too heavily from other works, which clearly left a sour taste in many mouths. It is a mostly forgotten flick now, but it is worth revisiting for sure, as it doesn’t merit the harshness of the contemporary criticisms it received upon release.